Standing inside the cavernous belly of the 800-seat West Kowloon Bamboo Theatre, bamboo master Ying Che and her head worker, Sunny Yim, gaze up at their creation. 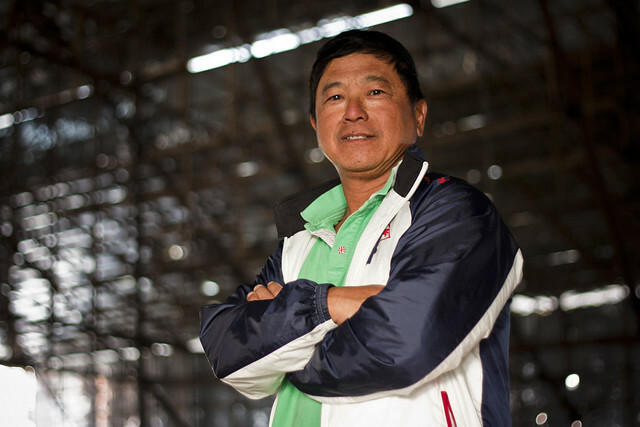 Ying married into a family of bamboo masters going back three generations. 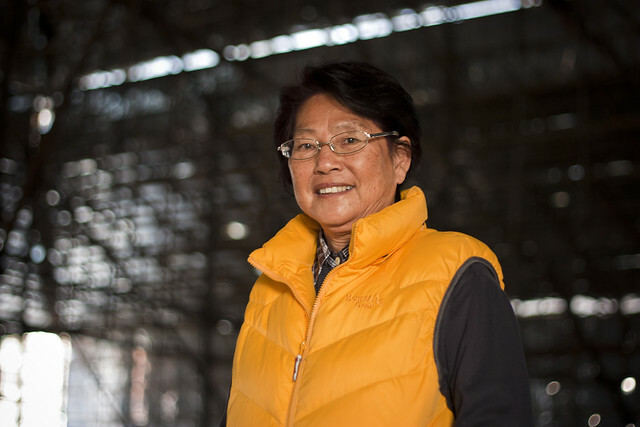 Every year, she oversees the construction of 30 to 40 theatres, which are commissioned by villagers to mark Chinese festivals. Inside, they eat, drink and watch Cantonese opera. The theatres are built entirely by hand, usually by fewer than ten workers, and they are held together with nothing but plastic ties. The biggest theatres can hold up to 6,000 people. 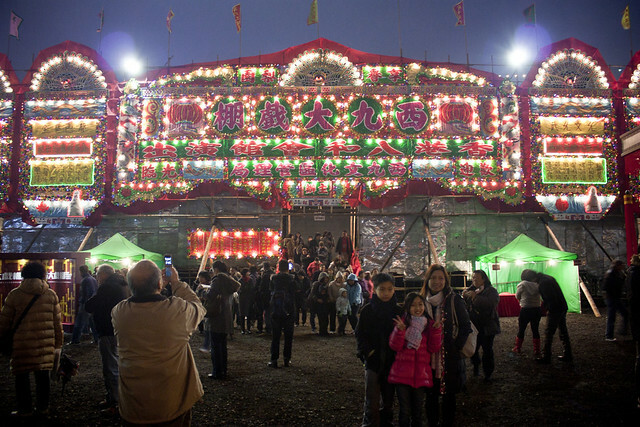 Increasingly, Hong Kong’s outdoor cultural events use steel-frame stages, rather than bamboo, because they are easier to assemble and require less-skilled workers. 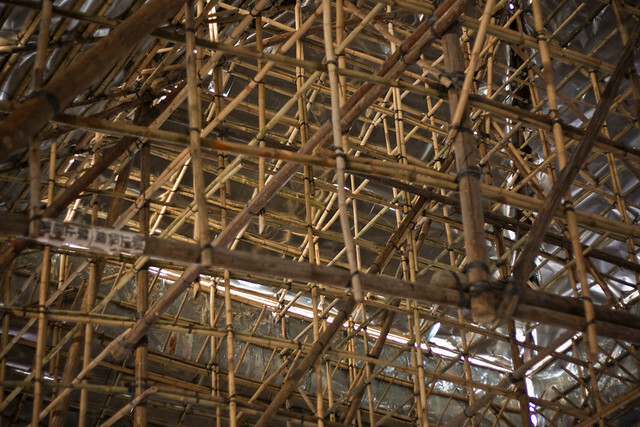 Bamboo is still widely used for construction scaffolding, and the frequency of accidents means that insurance companies are wary of bamboo theatres. The same has been said of Cantonese opera, whose popularity has declined in recent decades. What was once a massively popular form of entertainment is now seen by many as “something for grandmothers,” in the words of one opera scholar. It certainly doesn’t help that the last dedicated opera venue in Hong Kong, the Sunbeam Theatre, recently closed. 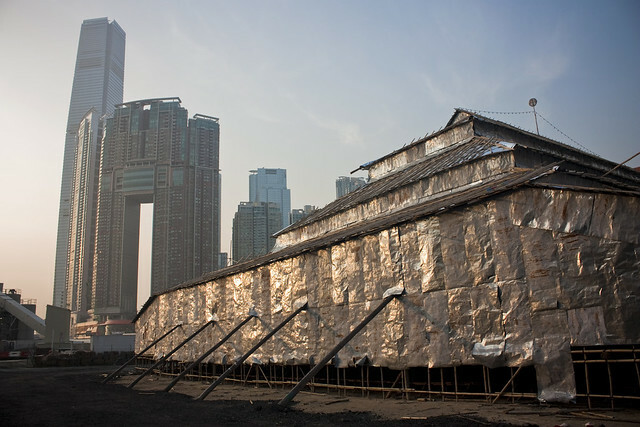 The West Kowloon Bamboo Theatre is part of an effort to reverse that decline. It stood for two weeks last January on the site of the West Kowloon Cultural District’s future Xiqu Centre, which will open in 2015 with a 1,100-seat venue for Chinese opera. Over the course of the Chinese New Year holiday, the bamboo theatre played host to 11 sold-out Cantonese opera performances, an eight-hour screening of classic Hong Kong films and an exhibition of new artworks commissioned by M+, Hong Kong’s future museum of contemporary visual culture. Making Cantonese opera relevant again is key to its survival. In the early years of the 20th century, thousands of actors travelled by boat to perform in villages around the Pearl River Delta and overseas to Cantonese-speaking communities in Southeast Asia and North America. In the 1950s, large commercial opera houses opened in Hong Kong, and cinemas began showing Cantonese opera films. There was even a daily newspaper dedicated to the opera industry. In the 1960s, opera fell prey to the Cultural Revolution in China, and Hong Kong became a haven for the craft. But another kind of revolution took its toll on the craft: popular Cantonese film and music. Generations of people grew up without ever going to the opera. By the early 2000s, it seemed destined for obsolescence. Recent years show signs of a turnaround. 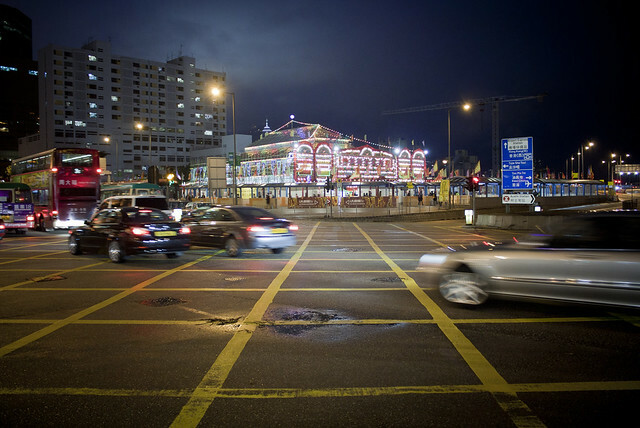 “Five years ago, Cantonese opera was an art form in decline,” says Dorothy Ng, an assistant professor at the University of Hong Kong’s Faculty of Education. Ng and her colleagues began developing educational material centered around opera, including script-writing, guest lectures by actors and field trips to opera performances. More than 30 secondary schools now incorporate Cantonese opera into their curricula; students have even written 16 new scripts that will be performed by young actors. Similarly, events like the West Kowloon Bamboo Theatre are a way to expand the audience for Cantonese opera. Unlike normal theatre performances, opera performed in a bamboo theatre is lively and informal. Ng calls it a “unique cultural space” where opera is integrated with architecture, food and other kinds of traditional performances like lion and dragon dances. The West Kowloon Bamboo Theatre drew from this tradition by pairing opera with film and contemporary art. Film critic Law Kar and artist Chow Chun-fai curated a selection of Hong Kong films including John Woo’s 1976 film adaptation of the classic opera Princess Chang Ping and Ann Hui’s little-known 1980 Cantonese opera ghost comedy Spooky Bunch. 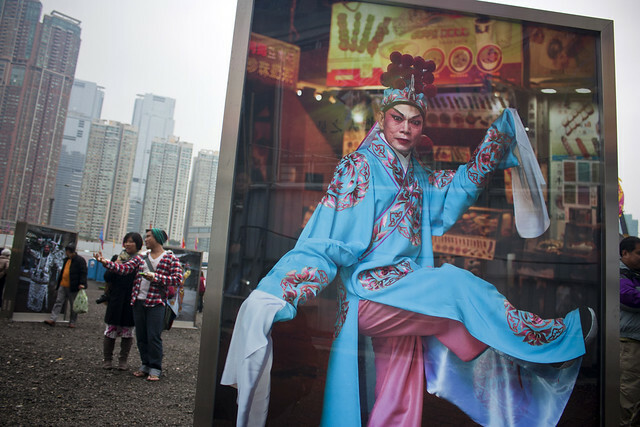 Outside the theatre were lightboxes displaying photographer Michael Wolf’s portraits of Cantonese opera performers; instead of shooting them on stage, he had them pose amidst the bustle of Hong Kong streets, fully-costumed and in character. Artist Gaylord Chan refashioned traditional Chinese festival flags with unorthodox graphic patterns. Ink painter Chu Hing-wah created two installations based on Chinese paper craft and spinning lanterns. Composer Samson Young and new media artist Henry Chu designed an iPad app that deconstructs opera sounds and imagery. But that sense of remove served them well. They translated it into a generative music application that Young describes as “the basic building blocks of Cantonese opera taken entirely out of context.” Users can explore the progressively more abstract sounds of six Cantonese opera instruments interact with geometric portraits of Chu and Young in opera makeup. It’s Cantonese opera for the eight-bit generation. Now that they’ve crossed the threshold of working with a traditional Chinese art form, Young and Chu say they are open to doing more work that explores Cantonese opera. “I’ve gotten over my anxiety of creating something authentic,” says Young. This entry was written by Christopher DeWolf , posted on Wednesday May 02 2012at 11:05 pm , filed under Architecture, Art and Design, Asia Pacific, Heritage and Preservation, History, Interior Space, Public Space, Society and Culture and tagged Art Installation, Bamboo Theatre, Hong Kong, Informal Space, Kowloon, Public Art, Street Performance, West Kowloon Cultural District . Bookmark the permalink . Post a comment below or leave a trackback: Trackback URL.